For about a week or so, the big question that was tossed about in light of the Indianapolis Colts’ quest for an undefeated season was whether Peyton Manning and Co. would play the entire game Sunday against the New York Jets. 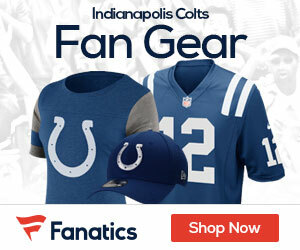 The issue was laid to rest in the third quarter when head coach Jim Caldwell brought in the reserves; the Jets capitalized on the act of mercy as they rallied to keep their slim playoff hopes alive, defeating Indianapolis 29-15 at Lucas Oil Stadium. The Colts struck paydirt first as Joseph Addai scored on a 22-yard run while adding a 22-yard Adam Vinatieri field goal to jump to a 9-0 lead; a 25-yard Jay Feely FG helped New York get to within 9-3, which would be the score as both teams went to their respective locker rooms at halftime. The Colts’ downfall began when Brad Smith fielded Pat McAfee’s kick to start the second half 6 yards into the end zone, ran it out, found a seam along the right side and raced down the sidelines. He even managed to stay in bounds after getting hit at about the Colts 20, going 106 yards to give the Jets a 10-9 lead. But the Colts came right back. They moved 81 yards, the last coming when Donald Brown bounced off two Jets defenders and scooted into the end zone to make it 15-10 with 10:13 left in the third quarter; Brown’s conversion run failed. At the 5:36 mark of the third quarter, Caldwell pulled Manning and Co. with the Colts holding a 15-10 lead. That was it for Manning, Reggie Wayne, Dallas Clark and Joseph Addai – and the Colts’ win streak. 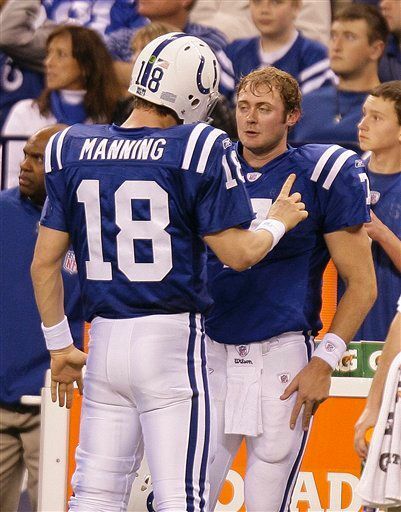 When Curtis Painter, Manning’s replacement, returned to the field for his second series, the boos began. They grew louder when Painter was hit by linebacker Calvin Pace and lost the ball, with Marques Douglas recovering and scoring. A 2-point conversion pass from Mark Sanchez to Dustin Keller made it 18-15 and put the Colts’ hopes for victory in jeopardy. The Jets would ice the win in the fourth quarter on a 43-yard Feely FG and a 1-yard Thomas Jones TD run. Sanchez was efficient, at best, going 12-of-19 for 106 yards while Manning went 14-of-21 for 192 yards; Painter was decidedly worse, going 4-of-11 for 44 yards and an interception. The Jets rushed for 202 yards, led by Jones with 105 yards on 23 carries and a TD while Shonn Greene carried the ball 16 times for 95 yards; Addai led the Colts with 40 yards on 6 carries. Jerricho Cotchery led the Jets receivers with 4 receptions for 45 yards while Keller caught three for 19 yards; Austin Collie led the Colts’ wideouts with 6 receptions for 94 yards while Dallas Clark caught four for 57 yards. New York’s (8-7) playoff aspirations are on the line next Sunday when tey host the Cincinnati Bengals while Indianapolis (14-1) finish their regular season when they travel to Buffalo to take on the Bills – also next Sunday.